Most music apps are a matter of code, but every once in a while, someone tries to do something that only hardware can handle (see also: recording, DJing, and some instruments). Such is the case with Backbeater, an intriguing iOS app whose goal is to teach drummers to stay on time without resorting to a click track. 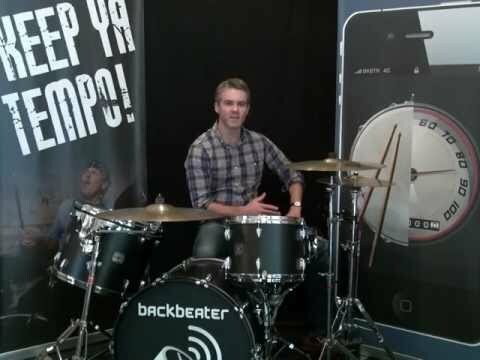 Backbeater uses a special hardware sensor that connects to the snare drum in a standard drumkit, and then displays the tempo in BPM to the drummer so they can practice and perform in a whole new way. We caught up with Backbeater founder, Kiwi, Sparkfactor Design project manager, and sandwich-eater James Flynn at DUMBO Summer Friday to find out how this one-of-a-kind app (video below) came to be. Eliot Van Buskirk, Evolver.fm: I just saw it in action, but in a nutshell, what are you trying to do with this thing? James Flynn, Backbeater.com: I am trying to tell drummers how good they are at staying in time. I think it’s a fundamental skill of a drummer, to be able to stay in time and know tempos really well. So it’s a tool for drummers to train themselves to play certain tempos, to know what certain tempos feel like in different situations, and basically get that level of precision if they want to. Evolver.fm: How did this idea occur to you? The sensor costs $39; the splitter (for playing along with a metronome or music) costs $15; and the hi-hat clamp (for holding the iPhone within your drumkit) costs $25, or you can get all three for $69. Flynn: I was having a continual argument with a guitarist in my band [we're waiting on a name/link], who was insisting that I was speeding up. What I noticed was that in different environments, the same tempo feels different. If you’re nervous, or if you’ve had a drink, or if you’re excited at the chorus or the end of a song, you tend to speed up. Tempos feel different. He said I was speeding up, I didn’t think I was. I looked around for a solution — I figured it’s not a complicated problem — but there wasn’t anything satisfactory on the market. There were a couple of devices, some studio equipment, but nothing really approachable. I figured with the advent of iOS and that interface, you could stick a sensor into the phone and basically do it all with iOS, and with Android, eventually. Evolver.fm: Most of the apps that we write about are obviously only apps, but it seems like what you’re trying to do isn’t really possible using the iPhone microphone, so you made this sensor. How are you making those? A lot of people in our world don’t know how to do a physical object. Flynn: It’s been a little bit guerrilla. I contacted a manufacturer of drum triggers and basically got them to help me: They put a cable on it that was compatible with the iPhone, and I actually, at the moment, hand-make them myself. There are a few electronics inside the sensor that I do myself. Once I get to any reasonable volume, I’m hoping to have someone else do that. They’re not completely custom-made, but I’m hoping they will be. I basically cobbled them together from existing products. Evolver.fm: Is the goal to end up in Guitar Center? I could see this being there, maybe. Flynn: Yeah, I wouldn’t turn it down probably, if they came knocking. I think it’s a really useful tool. All the drummers I’ve talked to, and a lot of professional drummers and drum teachers love it — they insist on its utility, and it’s really handy — anything to help drummers to learn the fundamentals. Evolver.fm: What are the advantages of learning to play this way instead of just playing to a click track? Flynn: The drumming world is divided into drummers who play to a click track, and drummers who don’t. It’s something that instills fear in a lot of drummers, and I guess some drummers really make a niche out of being able to play to a click track. But a click track dictates to you the tempo that you’re playing — it’s not a passive system. This enables you to just get feedback on what you are doing. It feels completely different to having something dictated to you in your headphones, telling you the tempo to play. This way, I believe, you can train yourself to be a click track. Evolver.fm: …And yet retain the musical expressiveness of being able to shift the tempo. I was frustrated when other band members complained that we were playing some songs too fast or too slow. There is a similar product named Tempo REF that helped settle these disputes until left behind in a studio. Backbeater looks like it may be better. With the REF, you could punch in up to 66 tempos in advance. So you could program in a set list and it would count off the tempo to lead in to the next song. Does Backbeater have a similar feature? This is the tempo technology I’ve been needing! I saw you guys at a road show and the interface is super easy to use. Its just a clean and handy way to keep on beat. It just works.